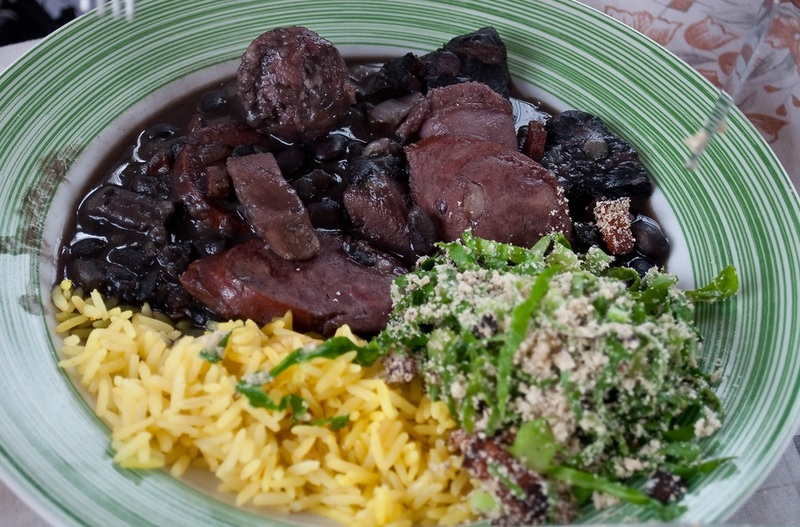 Feijoada is a a stew of beans of Portuguese origin. It is commonly prepared in many portuguese speaking countries like Portugal, Angola, Mozambique and Brazil. However, the recipe differs from country to country. Well, there are many feijoada's recipes out there, but none are original / traditional. Also, not as good as the ones made over here in Brazil. So without further delay, please find below the ingredients and instructions for the best brazilian feijoada in the world! This brazilian feijoada recipe contains a lot of ingredients which may have a different name in your country (or region). If you don't understand what feijoada's ingredient is, just follow the link to the ingredient page and you will see a typical picture of it. Step 1. In a sieve, wash the beans, transfer to a bowl add plenty of water and let it soak for about 12 hours. Change the water at least once. Step 2. Cut the jerky into pieces, remove and discard the fats, and put the jerky in a bowl full of water and soak for 12 hours, changing the water every 3 hours. Step 3. Dice the bacon into large cubes. Separate a small portion and cut the rest into small pieces. To cut the pork rib into pieces, place the rib on a board and leave the bone part up. With a sharp knife, cut the meat by following the line between the bones. Reserve. Step 4. Drain the water from the jerky and place it in a saucepan. Cover with cold water and bring to heat to boil. When boiling, drain the water and cover again with cold water. Return to the heat and let it boil. Drain the water and set aside. Step 5. Drain the water from the beans and place it in a large saucepan. Cover the beans with plenty of water and bring it to a boil over high heat. Meanwhile, wash the orange very well under running water. Step 6. When boiling, lower the heat and add the whole orange (with peel) and the jerky. After 30 minutes, add the reserved ribs. After another 30 minutes, add the smoked meat. Remove the orange and discard it. Then add the sausages (without chop) and bacon. Let it cook for another 90 minutes or until the meat and beans are tender. Step 7. Chop onion, garlic and the green mix. Take a large frying pan over low heat, drizzle a little olive oil and add the chopped bacon. Then, add the onion and wait for 2 minutes. Add the garlic and cook for another minute. Put the green mix, cumin, paprika, chilli pepper and mix them well. Step 8. Take a ladle of bean, from the feijoada, without the bean broth, place it on a plate and smash the beans with a fork. Add the smashed beans in the frying pan and mix well. If necessary, add a little bean broth. Step 9. Transfer the braised mix from the frying pan to the feijoada pan, mix and cook for a few more minutes. Try the feijoada and check if it needs salt and pepper. Step 10. Remove the sausages from the pan and place them on a board. Slice the sausages and place the slices in the feijoada’s pan. Wait for the feijoada to warm up and serve next. Step 11. Serve with white rice, dark cabbage, farofa, fried manioc and orange slices. Oranges: Step 1. Place the orange over a board, and with a knife cut off one slice from each edge. Then place the fruit on the vertical position and cut off the peel and the white part. Cut it from top to bottom following the curves of the fruit. Step 2. Place the fruit on your palm and cut a V between the white lines then cut the orange slices. On a plate cut the whole fruit same way and you will be able to use all the juice from the orange.